Conan Doyle’s house ‘Undershaw’ has now been unoccupied for over 9 years and during that time the owners (Fossway Ltd) presided over vandalism and dilapidation taking it from a hotel, from which the hoteliers did not wish to vacate, to the sorry state we see today. The speculator owners’ objective to gain a very valuable planning permission to over double its value with a right to create at least 8 separate dwellings. In the speculator’s last attempt, now comprehensively declared unlawful by High Court judges on 3 separate occasions, it should be apparent to even the most non-legal person that Waverley Borough Council’s decision of September 2010 was unlawful. However, in your main front story of last week you quote a ‘council spokesman’ as saying “the legal advice we received was that the original High Court decision was incorrect”. To this I can only say they could not have read the long reasoned judgement very closely for on a number of points the decision was held to be clearly unlawful. This debacle has cost Waverley Borough Council probably in the region of £50,000, and they must in future get only the best and most experienced personnel on cases of this nature, and at a very early stage. I notice in the columns of your paper that Councillor Taylor-Smith, who held the important planning brief until after the initial High Court decision, has now moved to another portfolio for Waverley Borough Council. Putting on one side all the enormous attention this matter drew from the world’s media – including the front page of the Los Angeles Times and Public Channel No. 1 of Russian TV – it is surely apparent that the public do not want this house and grounds divided into separate units; the speculator should have been told this many years ago. Speculation by its very nature is a risk, and he has comprehensively lost. The speculator and his local planning consultants should be told not to waste any more time with dreams of division and new buildings, but to get this listed building back into repair immediately. 1. All lead stolen from the roof has been replaced by very temporary bitumen felt. 2. The large heraldic window with Doyle’s family crests is still broken over 7 years after sustaining damage. 3. Doyle’s antlers he affixed over the front entrance have been stolen, and many windows smashed. 4. The southern third portion of the front elevation of the carriage block has been replaced by some modern materials totally mismatching the remaining third of the building – the new walls and windows completely clashing with the original remainder. As a Grade 2 listed building the owner should have sought Listed Building Consent (LBC) for this work – he did not do so. 5. All kitchen and bathroom fittings, and much pipe-work, have been stripped from the house – all again without LBC. 6. The single storey kitchen building – part of the house at the rear and, like the carriage house, all part of the Listed building – has been totally demolished. This was a building of over 600 sq. ft. and also provided a fire escape access for the hotel. Brickwork adjoining this demolished building now exists, hacked and broken with the cavities exposed to the weather – all again without LBC. 7. Finally, and probably the greatest disaster to befall this building, all plaster has been hacked off the walls of the top (2nd) floor, leaving this top floor like a bombed-out war zone. As a building specialist I can categorically say that essentially only the ceilings, and then only in places, where damaged by water ingress after the loss of the lead from the roof. This historic plaster to the walls was examined by me carefully before the event and was essentially in good condition. However, without (of course) LBC it has all been hacked away from the walls. I have asked (in writing) Waverley Borough Council if they are going to prosecute the owners and they advise me that they are not going to do so. I have a letter to this effect from Mary Orton, Chief Executive, Waverley Borough Council. Thus we have a situation where Waverley Borough Council recently bulldozed down in another part of the borough, an extension built slightly larger than the permission, whereas here, where there are seemingly numerous breaches, they are prepared to do nothing. It is to be hoped that owners of other listed buildings in the borough do not take note of this example as a precedent. “We visit the site regularly. The last time we visited was at the end of October. We are content it is being adequately maintained” (are they blind?!). “Our focus will be working with the landowner on achieving a solution which provides the right balance between …” Thus it can be seen that the councillors must now tell the Chief Planning Officer that no further dialogue is pursued with the speculator other than the re-activation of the Urgent Repair Notice of November 2008 and that there will be absolutely no development of this site. Would Jane Austen’s Chawton, Gilbert White’s Selborne, Winston Churchhill’s Westerton, Charles Dickens’ Rochester, Henry James’ Rye, etc. countenance division of these houses so that the dining room is in one house, the drawing room is a second, and the study in a third, with destruction of the stables and well – as was passed by Waverley Borough Council for Undershaw? I do not think so. The houses of other writers I mention have put their locations on the world literary map with resultant tourist advantages – the same could happen for the regeneration of Hindhead. There are several people interested in buying the house – it is not large in comparative terms for the type of dwelling (7,500 sq. ft.) – and making it into a family home. One person is very keen, has renovated literary houses in the past, and wants to spend in the region of £1.5M purely on sympathetic restoration work, at no cost to the public purse whatsoever. He has already obtained planning permission from Waverley Borough Council (August 2010) for the use of Undershaw as a single dwelling. He is prepared to pay a reasonable price for the property, but, of course, to reflect it having absolutely no redevelopment potential whatsoever and requiring, under its listed status, about £1.5M of repair expenditure. He will willingly step into the shoes of Waverley Borough Council if CPO procedure proves necessary. He has recently written to the Chief Executive of Waverley Borough Council to this effect, without, to date, a reply. Thus the property will be restored, limited public access will be allowed, and in the long-term all options will be available for this iconic world-renowned house. To the executive (councillors of Waverley Borough Council), the ball is now very much in your court to exert your total control over a proved failed planning department (in this matter), and not allow the officers of that department to “bail out” a speculator, who has presided over almost total dereliction of one of Britain’s great literary houses. A number of websites, individuals, societies, groups and “ambassadors” are endeavoring to raise funds on-line to save Undershaw at Hindhead. This blog is not a solicitation for funds. 1896. 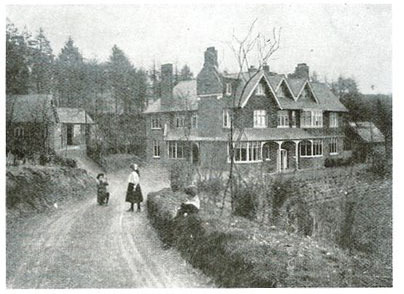 ACD lived at Morefields, a small local Hotel, and visited the property daily to supervise the construction with the architect Joseph Henry Ball. Virginia Wolfe visited the building site. October18, 1897. The Doyles move into Undershaw. ACD reckons it cost him £10,000 and annotated it in his notebook. Bernard Shaw did not move to the area until two years later. 1902. ACD received his knighthood here. July 1906. Wife Touhy died after a long illness with Tuberculosis and is buried at Grayshott Church Cemetery approximately one mile away. Doyle’s mother was also interred there in 1921. Doyle’s Son Kingsley in 1918, and daughter Mary interred there in the 1970s. Early 1907. ACD takes up the cause of George Adalji. This case and the case of Adolph Beck result in the establishment of the Court of Criminal Appeal. 1907. Sir Arthur remarried and moved to Windlesham in Crowborough, and rented Undershaw for another 14 years. 1908. Rented Undershaw to a retired Headmaster of a Public School, a widower of Aldous Huxley’s mother’s sister. 1910-1912. Aldous Huxley, as a teenager resided at the property and went to write Brave New World 10 years later. Doyle wrote The Lost World in 1912. 1921. 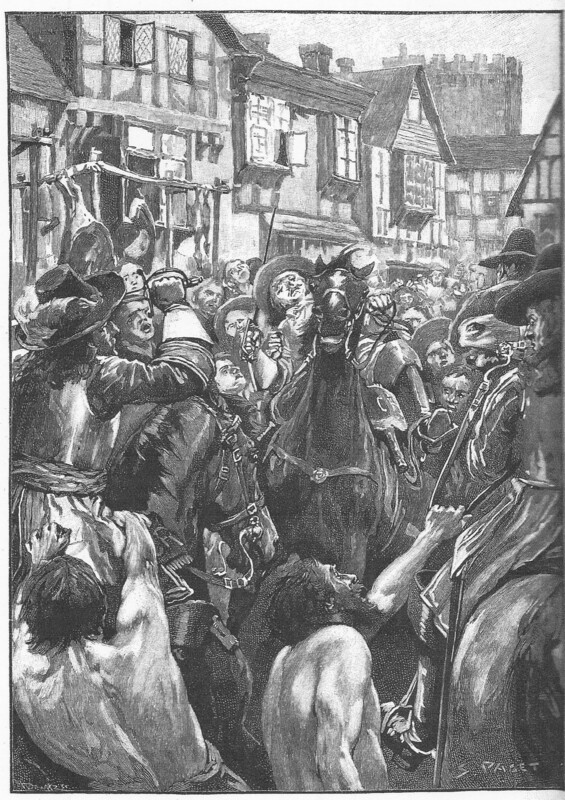 Undershaw sold for a “sacrificial price” of £4000. All real estate was depressed after WWI, and ACD needed the money to support his Spiritualistic Crusade. late-1920s. A new wing was constructed on the east side facing south of about 2000 sq feet. 1935-2004. Undershaw was purchased by the Bridger family who lived locally but never occupied the house. They leased Undershaw to individuals who operated a Restaurant-Hotel there. These individuals were always undercapitlaized, and therefore made very few changes to the building and grounds. Fortuitously many of the original features still exist. February 2004. Property sold to Fossway Limited (a company registered in the British Virgin Islands) for £1.1 million. May 2005. The Undershaw Hotel forced to close by the owner. Shortly after the closure the pair of antlers that were mounted at the entrance were stolen. All the lead in the valleys of the roof was also stolen resulting in significant water damage to the interior ceilings, and not the walls. June 2006. An application by The Victorian Society with information supplied by JM Gibson was submitted to English Heritage and the Grade 2 status was confirmed. An appeal also failed in early 2007. English Heritage did not consider the stables and the brick-lined well in their reaffirmed assignment of Grade 2. One of the major reasons in their decision was that Conan Doyle did not have the same status as a writer as Jane Austen and Charles Dickens. It should be noted that those two homes are both Grade 1, and were occupied for short periods of time, and both were built and designed by and for somebody else altogether. This decision was also based on Undershaw’s Architecture. 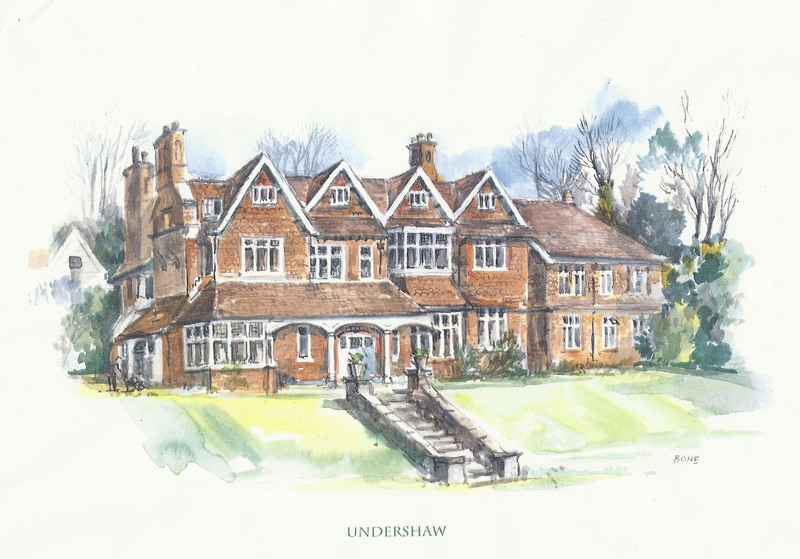 It should be noted in response that Undershaw was designed and built by Conan Doyle for his sick wife. The architecture of the home is essentially irrelevant, but it is rather the history of the home that is important. For example ACD had one of the first telephones in the area, and was a pioneer in electricity in the home coming from a steam furnace in the basement. January 2007. Waverly Borough Council erected scaffolding, tarpaulin and increased security and spent £70,000 which was recovered from the owners. The roof was repaired with cheap roofing felt and this is still in place today. 2007-Nov 2008. A modern exterior was installed in the coach house. The renovation was carried out without Listed Building Consent. Late 2008. The Undershaw Preservation Trust was registered as a Charity to preserve Undershaw by JM Gibson. November 7, 2008. Waverly Borough Council served an urgent Repair Notice, which was time restricted, and was not complied with by the owner. In spite of this No Compulsory Purchase order was issued. Negotiation were started with Wilson the architect for the property to be carved up into 3 houses vertically with a solid cement block in between, the add-on would be removed, and a terrace five separate Units would be added on the east. The coach house would make it 9 units altogether. March 10, 2010. A planning application received for the Southern Area, and considered by the full council in June 2010 and passed by a 7 to 1 majority. All conditions were finally satisfied. The plan called for 7500 square foot house to divided into three with cement partitions. The removal of 1800 addition, and five new 3-story townhouses. September 10, 2010. Full planning permission granted subject to Judicial Review. Under British Planning Law any individual can initiate a Judicial Review. December 2010. Application made to the Royal Courts of Justice with no relief of costs. Legal Assistance was not available. The case was accepted because it had an arguable case. JM Gibson vs. Waverley Borough Council. There was an attempt to make the legal case The Undershaw Preservation Trust (UPT) vs. Waverly Borough Council, but this was not possible because UPT was impecunious. June 2011. Pre-trial Judge approved the case to be heard in the High Court of Justice. May 23, 2012. Case heard in The High Court of Justice. (I was there!) and a decision to quash the development was given 7 days later. July 2012. Fossway’s application to appeal was turned down by another Judge. September 2012. The detailed reasons for the decision of May 2012 are contained in the issue of Journal of Planning Law. November 2012. A second appeal was granted for an oral hearing which was flatly turned down by a final third judge in the Hugh Court of Justice. December 20, 2012. A “For Sale” sign was posted on the property by Aequitas Property Agency.. The telephone number given was not answered until January 2013. January 6, 2013. The Sales agent, Rupert Maxwell-Brown stated on the phone the asking price was £1.2 million, He also indicated that any individual making an offer would have to provide evidence of adequate financial resources to purchase. March 2013. A business man, who has .. makes an urgent application to English Heritage for the grading to upgraded from Grade 2 to Grade 1 or Grade 2*. English Heritage is still considering this application 11 months later. May 2013. A second supplementary portfolio of evidence was also submitted about ACD’s importance as a writer. October 2013. A group headed by Marek Ujma “negotiates” a purchase price of £1.65 million, and also has a six month window to complete the fund raising and presumably complete the transaction. January 7, 2014. in a BBC television interview Ujma (from Grayshott) estimates the cost at £3.5 million to purchase and renovate Undershaw. Ujma does not mention the ongoing costs associated with operating a Heritage Centre. Febraury 2014. English Heritage has appointed a team of Assessors to view Undershaw with the permission of the owner. Their report is eagerly anticipated. mid-February 2014. The original ‘FOR SALE’ board is still in place at the entrance of the property.